Vacuum cleaners revolutionized the way that we clean. Imagine having to clean every square inch of your workplace using only a broom and a dustpan. If that doesn’t sound torturous, we have no idea what does. While vacuums are certainly a godsend when we need to get a good deal of cleaning done fast, sometimes they don’t suffice. If your vacuum at work has been having trouble keeping up with all of the messes lately, you may be considering investing in a new model. But how do you make sure that this next vacuum doesn’t go the way of the previous one? The answer is simple. You need only invest in the best commercial vacuum cleaner possible. The TaskVac is a lightweight commercial vacuum cleaner that is designed by Hoover Commercial, one of the best makers of commercial vacuum cleaners that you will come across. This vacuum is a little more affordable than some of the other models on this list, as it can usually be found for about 150 to 200 dollars. The included hard bag with a quick-drop functionality allows you to dump out dirt and dust and move right onto the next task, something which is crucial in a commercial environment. When you are trying to make sure a larger area is clean, every second saved can mean a far faster cleaning process. This also comes included with a 35-foot cord which is high-visibility. This is crucial in a workplace because you don’t want any unsuspecting colleagues tripping over your power cable. The length of this cable is ideal for larger workplaces, so you won’t have to worry about constantly switching outlets. There are also five adjustable height positions which ensure that you will be able to reach under desks and other obstructions that you may come across. If you want a commercial vacuum cleaner which is both versatile and reasonably affordable, this model from Hoover Commercial is an excellent choice. 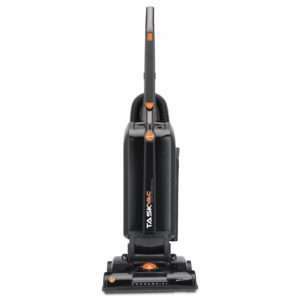 This model from Shark is an excellent choice if you are looking for an innovative design that improves upon the standard upright vacuum. There are few better options for a commercial upright vacuum if you prize versatility above all else. This model is also surprisingly affordable at only 200 dollars. The lift-away capability means that this model can be used as either an upright vacuum or a handheld model if you have to clean out areas in your workplace that are a little bit harder to reach. This commercial vacuum cleaner also features LED headlights so you will be able to see what you are cleaning with ease. The inclusion of a swivel steering mechanism ensures that you will be able to get this vacuum into more challenging places, such as under desks, even without using the lift-away system. The included large capacity dust cup means that you will be able to clean for longer periods of time uninterrupted, a crucial aspect in the workplace. The inclusion of a HEPA filter ensures that all of the dust which is sucked into this vacuum cleaner should be trapped inside. Thanks to this feature, your fellow employees will not have to worry about their allergies acting up while this vacuum cleaner is used. This is one of the more affordable commercial vacuum cleaners on this list, but this does not make it any worse than any of the other options. 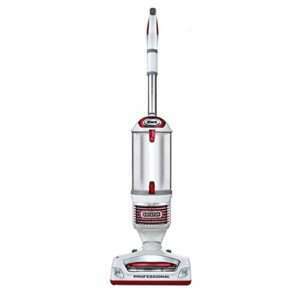 If you are looking for a vacuum which provides some of the best value for money when compared to the competition, it will be difficult to beat this model. Priced at around 170 dollars, you may not be expecting this model to offer much in the way of capabilities. You would be surprised, however, as this product is an example of how affordable products should be designed. Instead of sacrificing cleaning effectiveness, this model instead cuts out unnecessary features. While there may not be a wide variety of extras included with this vacuum, it gets the job done better than some products which are even more expensive. The brush roll rotates at about 6500 RPM, and it features double helix bristles to knock loose dirt and dust from the surface you are cleaning, even the harder floors which are more common at work. This model usually comes included with four free bags, which may be a little more helpful for residential users, but you will likely need more when using this for workplace cleaning. One of the more useful features is the automatic floor adjustment system which ensures that you will not have to make any changes when going from surface to surface. 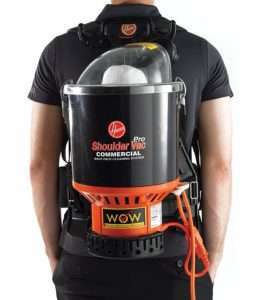 This commercial vacuum cleaner features a backpack design that ensures that it is more portable than most other canister vacuums. If you are looking for the best commercial vacuum cleaner that can be worn as a backpack, there are few better options than this model, and it is also highly affordable, at 225 dollars. The intelligent design for the harness of this vacuum cleaner ensures that you will not have to deal with any surprising backaches after using it. Weighing less than 10 pounds, you will find that this is a very comfortable vacuum which can be used for the extended periods of time required in larger workplaces. The inclusion of a power cable with a length of 48 feet ensures that you will not have to switch power outlets while you are doing your cleaning constantly. This extended power cable ensures that you can easily clean up larger areas, another feature which is accommodating for workplace usage. 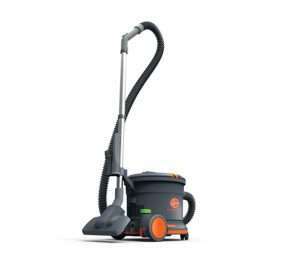 This vacuum is also relatively quiet when compared to other commercial vacuum cleaner models. If you are tired of the deafening din which emanates from other products in this category, you may wish to opt for the Hoover Shoulder Vac Pro. This allows you to clean while co-workers are still doing their jobs. The final model on our list is the CH32008 from Hoover Commercial. If you want the best commercial vacuum with a more traditional design, you may find that this product is more to your liking. It can be found for about 210 dollars, so it is more affordable than some of the competition. The inclusion of a 50-foot cord ensures that you will not have to switch outlets too often while you are working so you can clean up more vast areas at work. The 9.5-quart capacity keeps you from stopping to empty out the vacuum every five minutes. 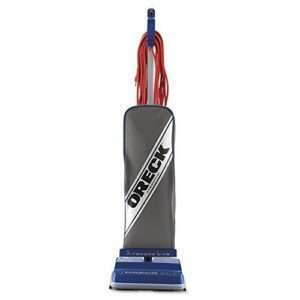 This vacuum is optimized for use in larger areas where you will have to do a good deal of cleaning. This model also includes hush mode which is useful for when you want to clean in relative silence. The CH32008 only emits around 62 decibels worth of sound while it is operating, so it is one of the more quiet vacuum cleaners that you will come across. This ensures that the office will not be disturbed every time the vacuum is turned on. As with most quality vacuum cleaners, it comes equipped with a HEPA filter to ensure that there are few issues with dust and dirt making its way back into the environment after use. This helps prevent allergic reactions from employees and colleagues. You have a broad range of options at your disposal when looking for the best commercial vacuum cleaner. Each of these models has their pros and cons, and they can each be suited for a particular use. We hope that our reviews have proved to be helpful.